A table could be any plain wooden object that is used in the front or side of the couch. We use them to place some accessories, sometimes we use them just to place a coffee mug, sometime to place the TV remote on it. In short, a wooden table is a necessary furniture item inside every house hold. 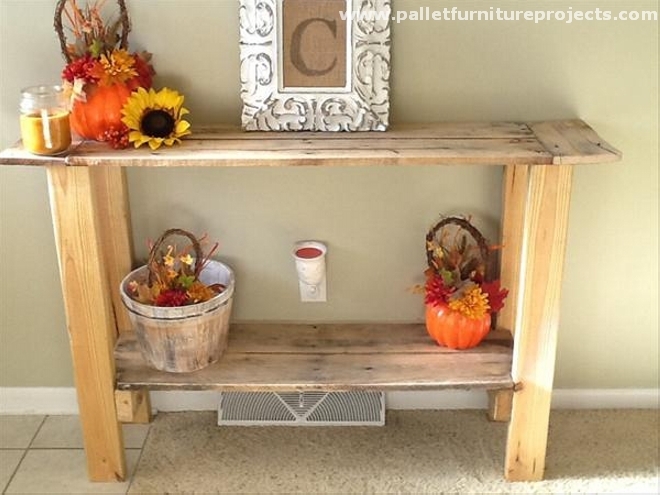 But what about a hallway pallet wood table? They are actually sleek and smart in design and shape, they are especially designed to be placed along the wall. They are more like a decorative addition inside the hallway. 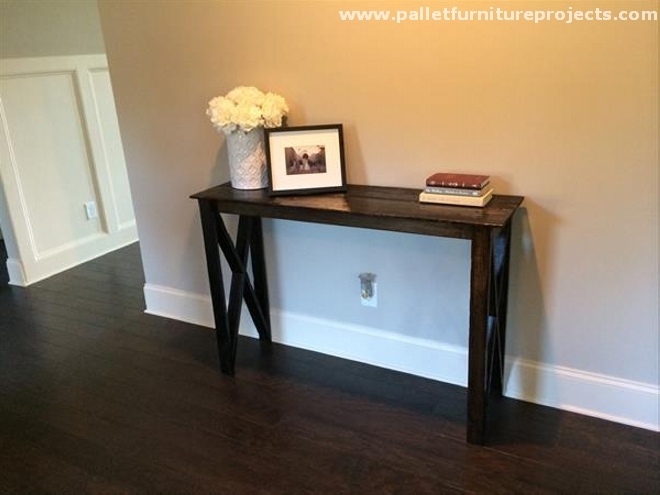 Let’s have a detailed look on multiple pallet hallway table ideas. This is from some perfect room setting in an urban lavish home setting. 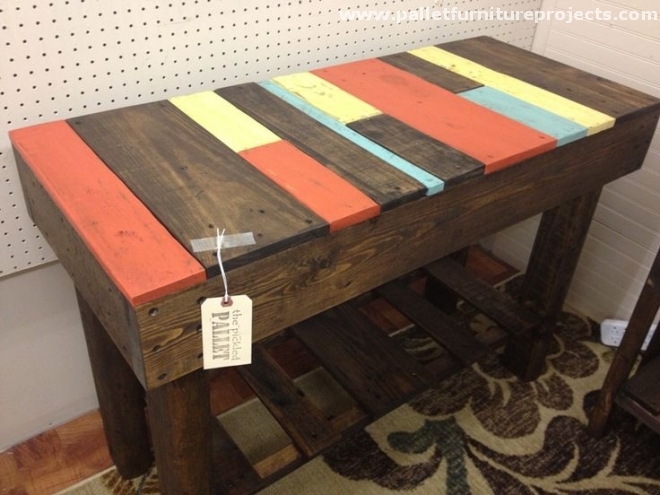 The most sophisticated wooden pallet repurposed table is made with some finest shipping pallets. This would be perfect display hub for your hallway. This looks superb on the wooden flooring. 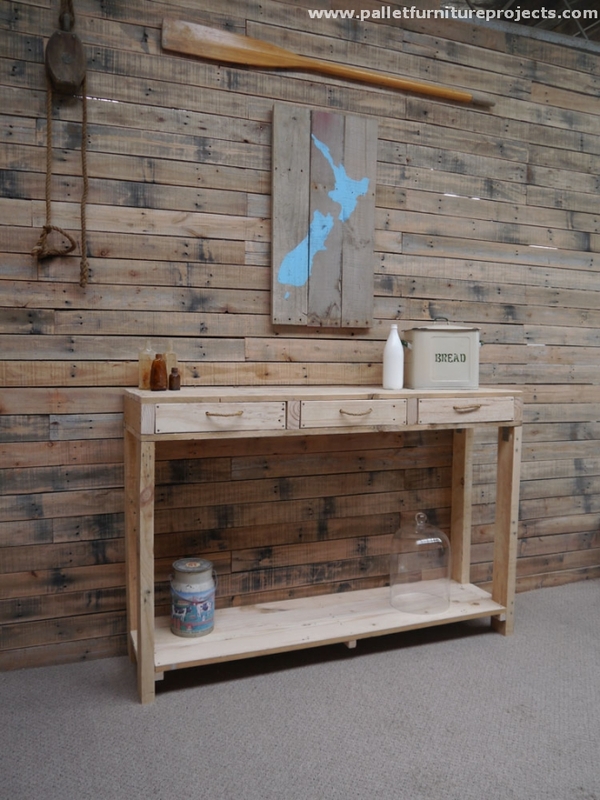 Here comes another classic wooden pallet recycled hallway table. This time we made it a bit typical by installing some built in drawers. Plus it is provided with ample storage space right below the drawers. We kept it unstained to maintain its rustic and natural look. 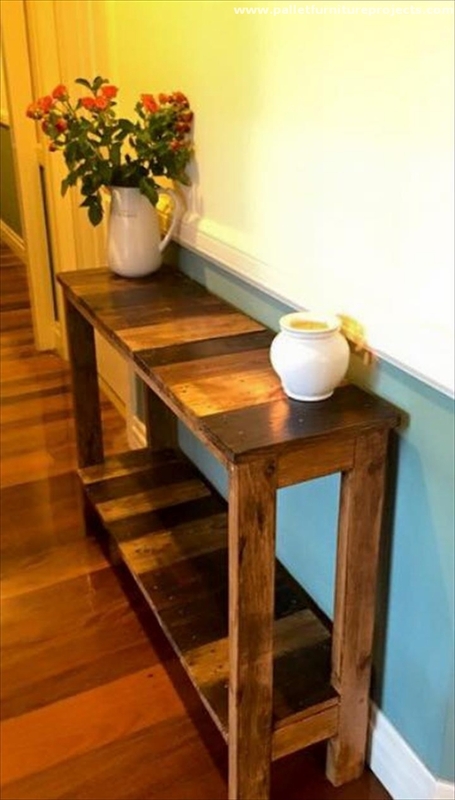 This sort of hallway tables are so damn common in the urban home settings. They are actually placed along the wall with a pure purpose to display some decoration pieces. While the additional storage space below can be consumed to place a number of books, you can also place a table lamp on it. From the very beginning of pallet recycling we have focused on the use of broken shipping pallets. Because they can’t be denied, with some minor modifications we can put the pallet wood in best use. Just the way we did here, this rough hallway table despite of the rough texture still makes a good combination. This is another classic hallway table, this is pretty huge, and we also kept it pretty tall. This is provided with ample storage space inside the hallway table. We stained it as bright white color, while the table top is painted as black color to make a classy contrast. 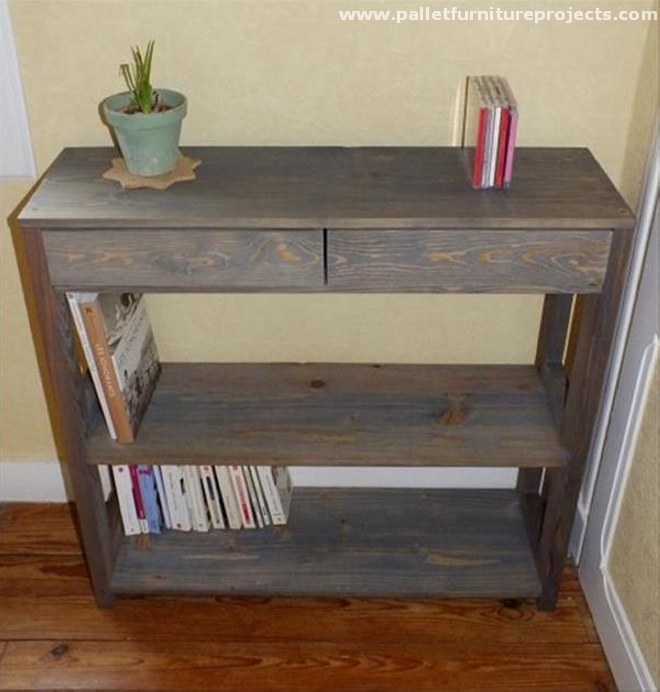 And this is a perfect demonstration of the use of some broken pallet wood planks. 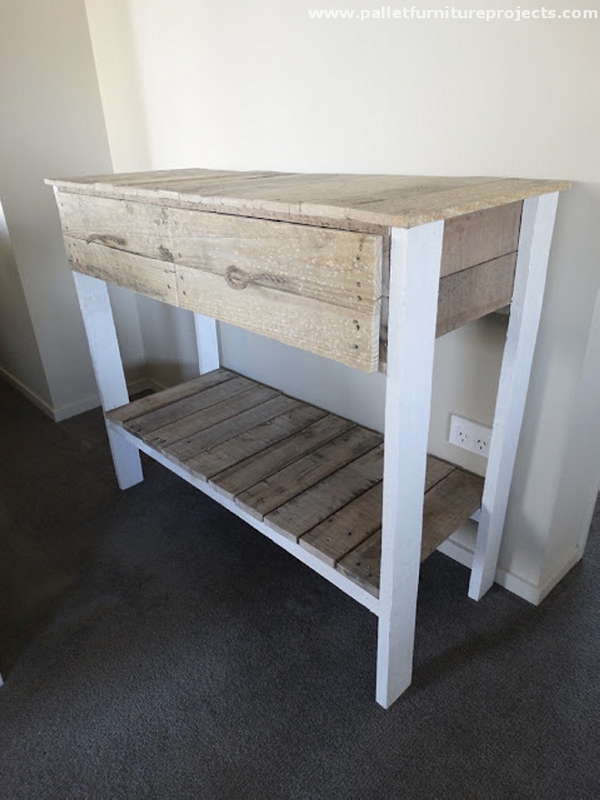 This multi tiered pallet wood table can be used as a side table and also as a pallet wood tools table if placed inside your domestic workshop. 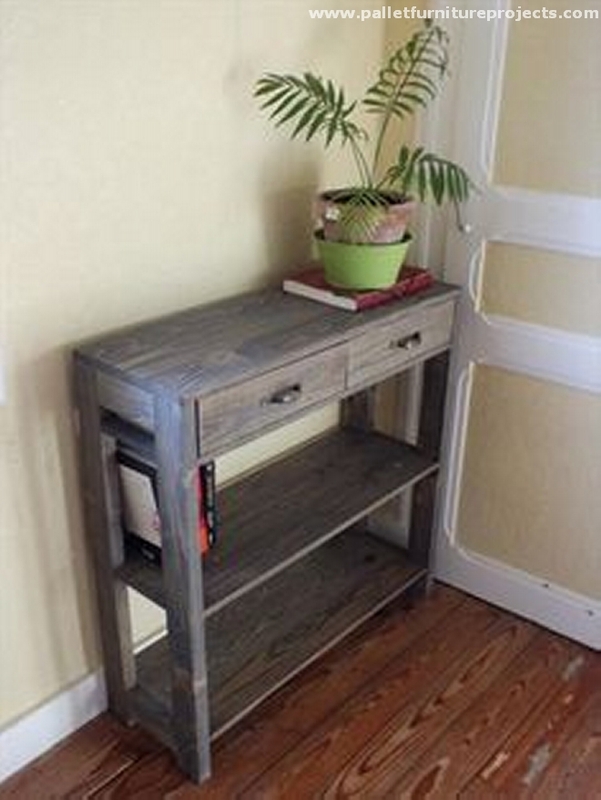 And this is again a rustic pallet wood hallway table. 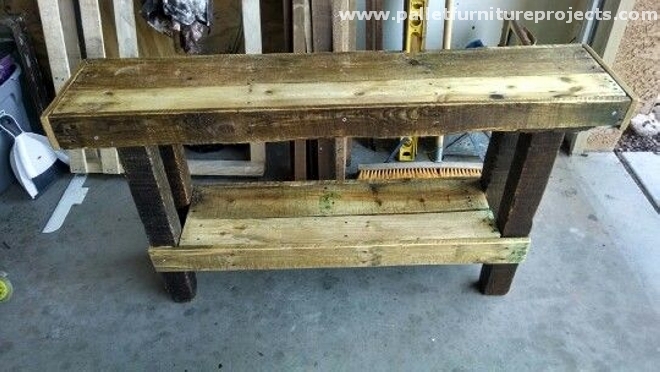 It has got a thick foundation made with some robust pallet wood planks, while the table top is kept quite slim which makes it look like a wooden bench. All the nail marks and stains are there on the top still it looks good lying in the outdoor. 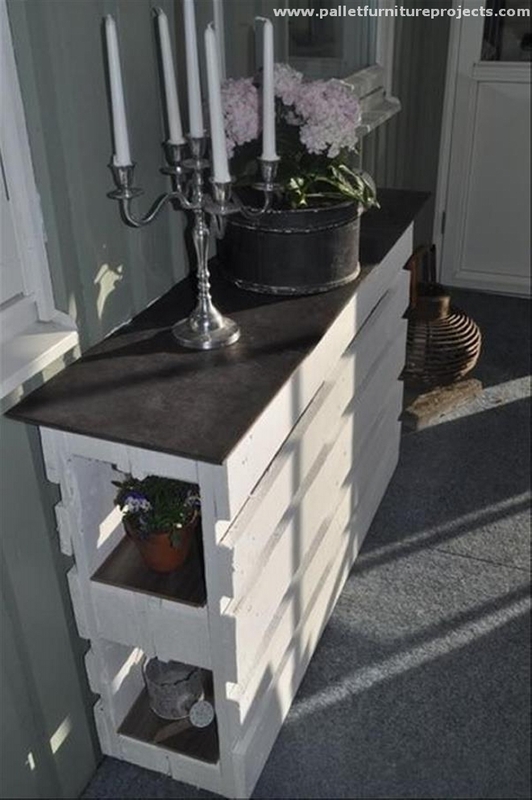 The pallet wood recycling is the art of ideas and innovations. We just need the pallet wood planks, we stain them according to our choice, we shape and design them again the way we like. 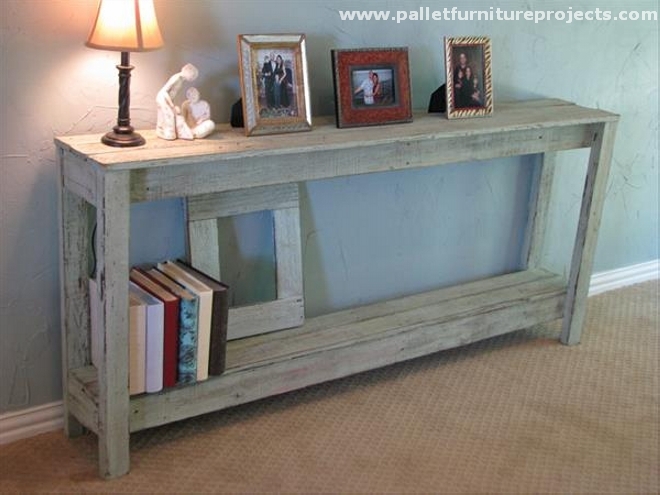 And we put them on the best use like here we did in the shape of this wooden pallet hallway table. 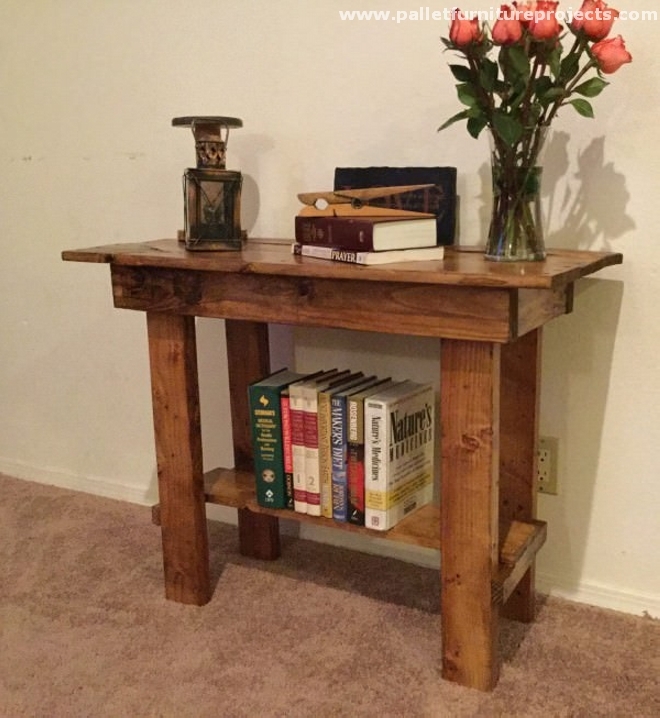 Yet again we present a decent pallet wood hallway table that is designed perfectly for the purpose it is prepared. As we said earlier that this is basically and artistic addition in the room interior so we have to focus on the appearance of the pallet wood hallway table. Wow, this is so damn graceful that it carries a tag saying pallet. This literally means that see guys, what wonders can actually the pallets make. 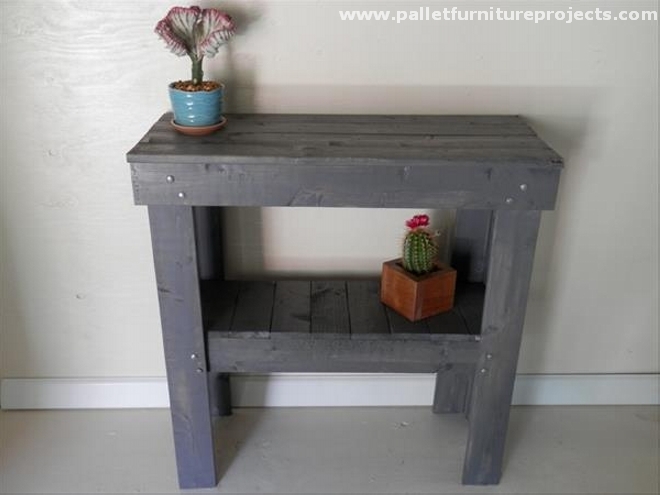 Random pallet wood planks painted in multiple colors are fixed on the top of the hallway pallet wood table. There are a lot of manipulations that can be done with the pallet wood. We have complete control over the shape and design of the pallet wood creation. 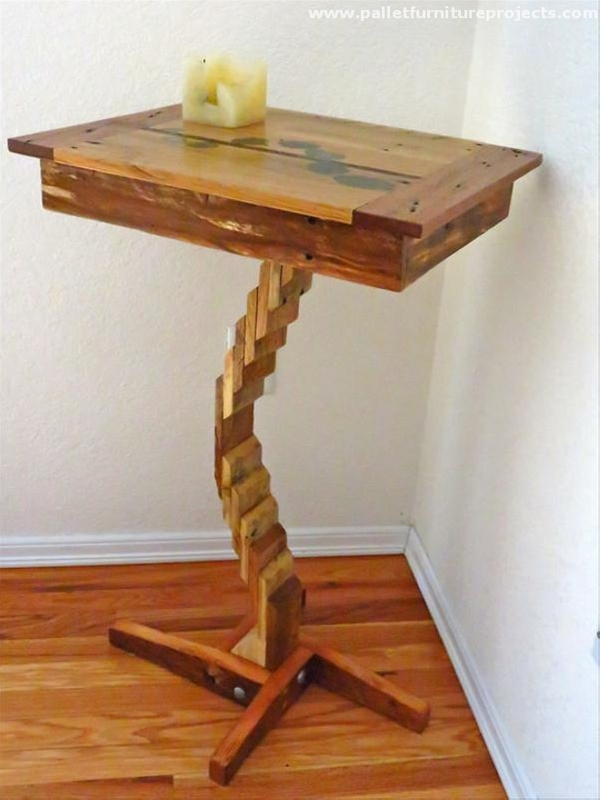 So we make minor amendments and we always come up with something different and unique just like this pallet repurposed hallway table. This is all about the strong imagination and the innovation that you guys can actually work on. Otherwise this sort of wooden creations can’t be found out in the market. 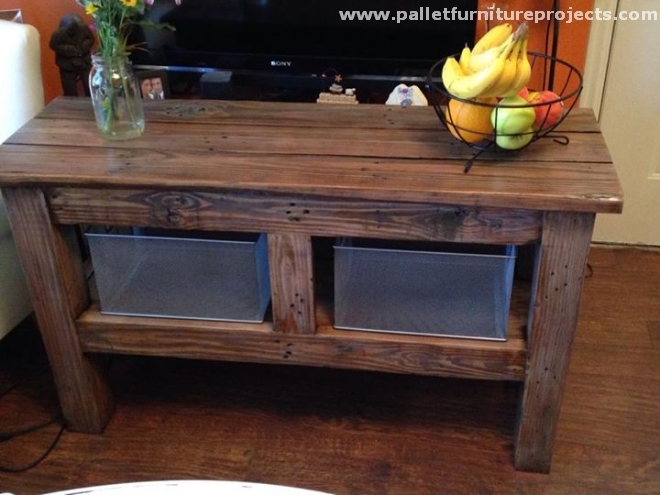 Made with some broken shipping pallets, this was very well sanded and stained so that it doesn’t stigmatize the beauty of the room interior. Coming to the next one in the line, this also looks like a pallet wood table for books. It has got a couple of drawers with some most stylish knobs, plus the multi tiered structure makes it a heaven for various accessories that we need to place on it. Now what about this one? Thick and strong foundation, sleek and smart upper top, a straight wooden slab as an additional storage rack that makes a perfect place for the storage of some books. And the top is a perfect display hub. 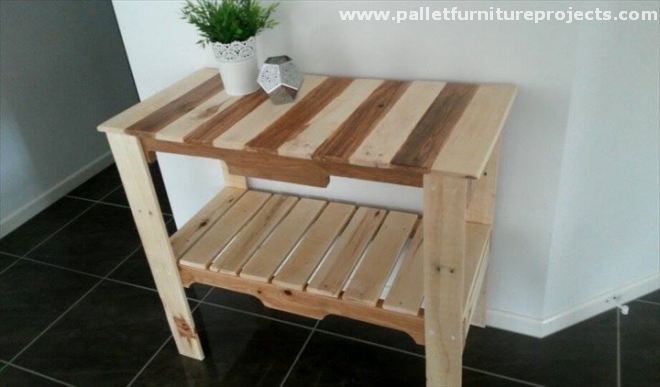 As we said earlier that in the course of pallet wood upcycling we also bother to take care of the broken and deteriorated shipping pallets because we can’t simply be lucky enough to always get some fresh pallet wood planks. 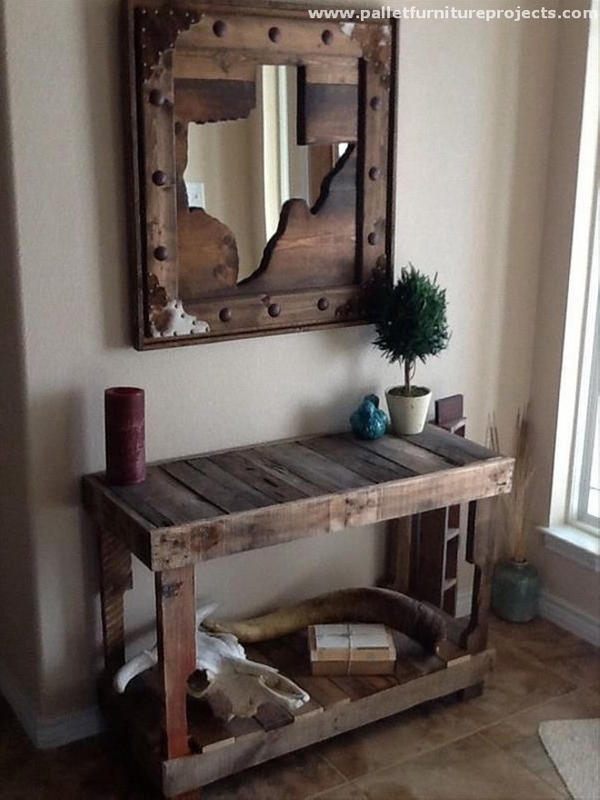 So for those broken pallets, this inspiration would work perfectly great. 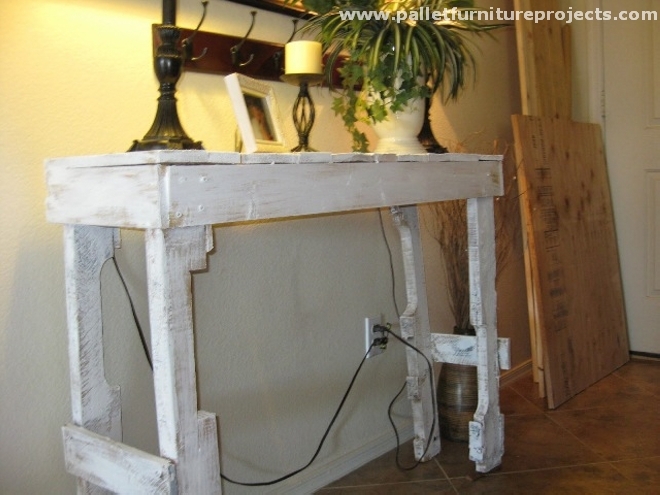 Ok, now you want to come out of the hallway and want to employ the same typical hallway pallet wood table for some other common jobs. As this pallet wood table if placed inside the kitchen, this would be a companion for the house ladies who run the kitchen affairs. 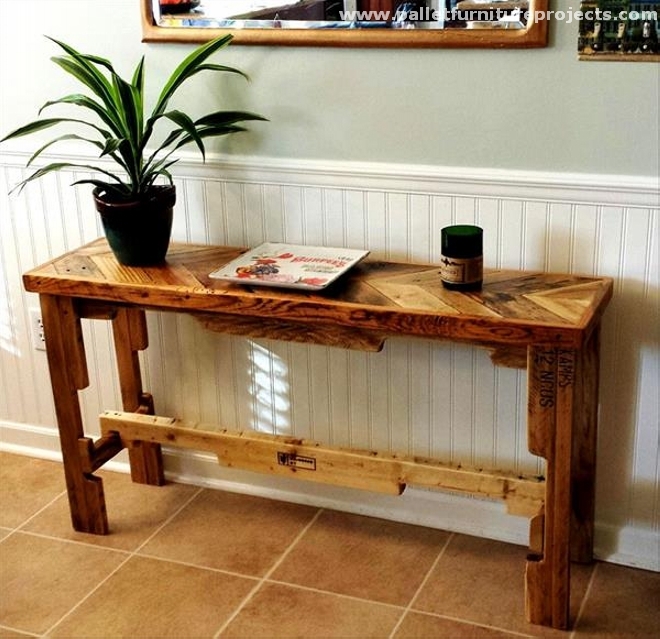 Another addition in the typical hallway pallet wooden repurposed tables. 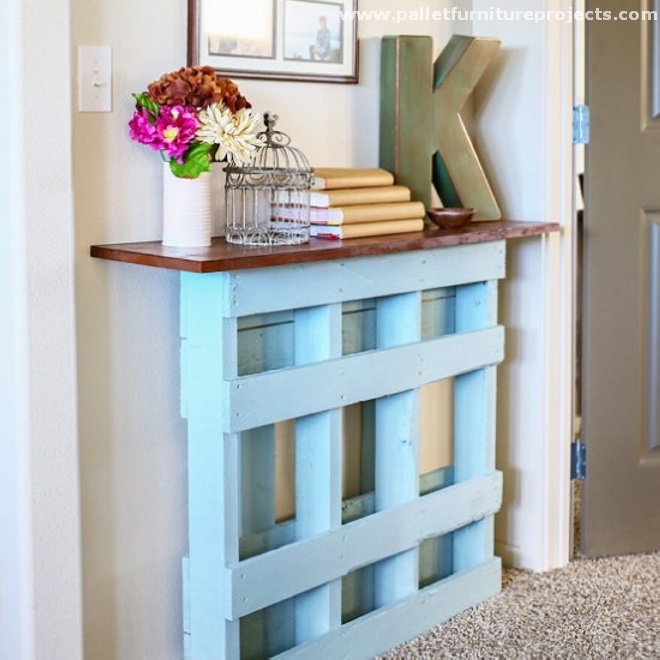 This has got the same typical design that is best associated with this kind of pallet creations. With some additional storage space right below the top of the table, this is certainly something pretty useful inside the hall. 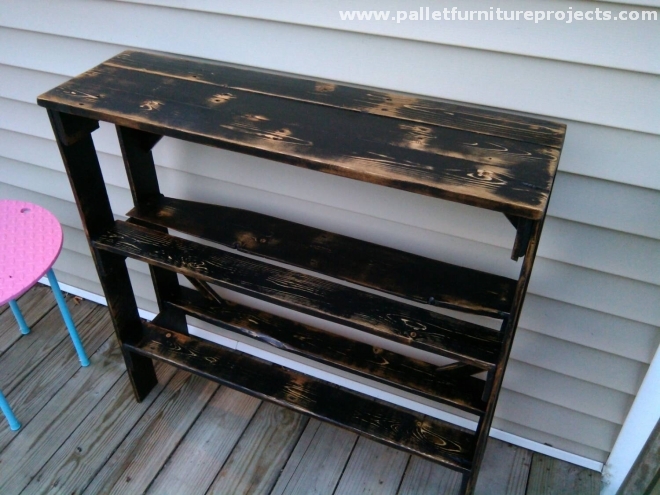 In the end, though this one holds the same typical design that we associate with the pallet wood hallway table. But I think just to make some difference, we have stained it in a very artistic manner like we stained the legs, but the rest of the frame and structure is left unstained. This made a contrasting look.